I have passed by this 1984 book in the book store but decided it was time to read it due to its sub-title: Using Evidences and Presuppositions in Defense of the Faith. 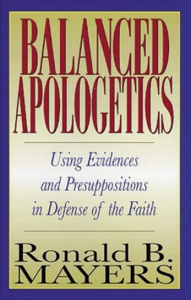 The classic battle within apologetics has been whether to be an evidentialist or a presuppositionalist. The former argues that we can present our faith to the lost man by appealing to evidences of God’s existence and revelation and that such a lost man has the capacity to understand enough to come under conviction of his sin. The latter emphasizes that a lost man cannot (or will not) know about God until God first works in the man’s heart. The first four chapters are a valuable contribution to our evangelism in this world. What does a lost man know? To what inside and outside of him can we appeal? How does a lost man recognize his need for a savior by the world God made and by the culture he himself makes? These questions are at the heart of current church philosophy discussions though we may not always realize it. I think Mayers (and others) has done us a service by again bringing apologetics into the forefront of evangelism.